So here's a question: JMS originally wrote an episode called "The Very Long Night of Susan Ivonova" which he ended up chucking because it turned out to be coincidentally rather similar to an episode of DS9. That was in season 2 or 3. He then wrote "The Very Long Night of Londo Molari," which he's said had no similarity to the long-lost Ivonova script, he just liked the title. Anyone know anything about "Long night of Susan Ivonova?" Do we know what the plot was, or anything like that? This episode may not have a lot of flashy action, but there's a lot going on under the surface! The most important plot aspect is that of Londo's apology. I realize that some who have posted about the inaccuracy of his statement, never having said he was sorry before, are very aware of previous episodes in which he has said he was. But I don't think that's the issue here - this is not about truth, accuracy, or amnesia. It's about his consciousness of guilt, and what he is saying is that for the first time, he is so aware of his guilt that he feels the need to accept and acknowledge it. That, tied in with the heart problems and the immediate threat of death, is one of those central human issues that makes B5 deeper than the usual space action fare of some sci fi shows. I like the way the camera angles show the transition from real events to dream sequence. The other subtle issue is that of Lennier's leaving the station. That he does so is understandable - it must be very difficult to see the object of one's unrequited love daily when that person is so deeply in love with someone else. However, when he says that he is going to the Rangers because it is the calling of his heart, that feels very wrong. Is he actually running away, as Sheridan suggests? What I see in his explanations and confessions - both he and Delenn know exactly what is going on, and Sheridan suspects as well - is something very different. When he says he is leaving to make himself worthy of Delenn, it is a declaration of battle with his rival and the first step to the very wrong, near fatal decision he makes later on. He is not accepting the decision of Delenn's heart, he is staking a claim for the future! From there, it is only a step to ensuring that the future takes place as he wishes it to - and earlier than anticipated. I think his leaving is most necessary for Delenn - she really needs to let him go. Yes, she loves Sheridan first, but Lennier has had a very special place in her heart that, on an unconscious level, is perhaps greater than is healthy for her marriage. When Sheridan says "Three's a crowd", and she answers that three is sacred for Minbari, it feels like an attachment which is too close for comfort. I enjoyed the brief scene between Vir and Lennier, especially the latter's misunderstanding of the name of the drink as that of a goddess and her temple! Since I rewatched "Comes the Inquisitor" recently, I just noticed this interesting comparison: Delenn is prepared to die for Sheridan, her destiny be damned, "alone in the dark with no one to see." In Season 4 Londo is placed in a similar situation time and time again, and he never does what she is willing to do. Of course, it could be argued that he feels he has a higher responsibility, to all of Centauri Prime... but what then of Delenn's cry, "One life or a billion, it's all the same!" For the most part, no, he was not willing. But remember when the Vorlon planetkiller came into the Centauri system after Londo had eliminated "everything touched by the Shadows" on the planet, and Vir said "not everything".... Without hesitation, Londo told Vir to kill him then.... and right at that point the planetkiller pulled away. (I know that fleet was ordered right about then to join the other Vorlon ships at Corriana 6, but to me it seemed almost that they somehow knew he'd said that, and that's all it took.) Of course, he was offering his life to save his homeworld and the billions on it, not for one other life, but I think it was his first real recognition of responsibility for what he'd done and that he owed his life to make amends. It was a start. Last edited by Alioth; September 5th 11 at 10:35. I like The Long Night of Londo Mollari. This episode does not move the story forward so much, but it does move the character of Londo Mollari forward, which is required for the story to move forward. I like the visuals in this, and the "dream logic" with Sheridan's outfits changing, and - as everyone else already mentioned - G'Kar as Cartagia. I was kind of pleased to see Refa again, too. I'm not a fan of Sheridan's little speech when he's watching Londo in medlab. He tells Delenn that Londo's recovery is up to Londo at this point. Basically he's saying that anyone who dies in medlab didn't want to live badly enough ... Does that idea come from his experience on Z'ha Dum? There's some humorously faulty medical jargon in this, but I can live with it I can also live with dual Centauri hearts that strangely look exactly like human hearts, which evolved for their very specific function ... But that's just the sort of thing you have to live with in sci fi. 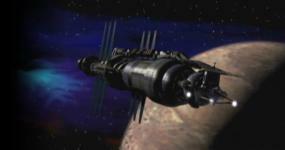 "The "A-plot" for the proposed season two episode was to have centered around the outbreak of the Narn-Centauri War, while the "B-plot" would have featured the founder of Babylon 5 visiting the station. There was also a "C-plot" that would have seen Ivanova being ordered by Sheridan to take some time off. The Shadow attack that led to the declaration of war between the Narn and the Centauri was later moved to ("The Coming of Shadows") while the story of Babylon 5's founder was at one point moved to the season 3 premier episode ("Matters of Honor") but was ultimately dropped. The episode title would later be partially recycled for the season 5 episode ("The Very Long Night of Londo Mollari"). " Seems like the main focus would have been the Shadow attack and the start of the war from Coming of Shadows rather than Ivanova herself. I think they probably chose the correct route linking this to Turhan's death with little in the way of distraction. That's some excellent detail, thanks for posting that! Maybe this is old news to the regulars here, but it's certainly new to me! One of my favorite episodes of the fifth season. Good look into the actual soul of Mollari. I do tend to agree somewhat that the episode feels like its going over character development we've already seen with Londo, perhaps for the benefit of new viewers given the focus of the end of the season? I don't think the idea of Londo getting his "hand caught in the cookie jar" really meshes with the wider story either. For one thing this never really happens, he doesn't really have to face the music in terms of punishment until the end of season 5. For another I think it ignores that the series very clearly does show that Londo is aware of and often pained by the immorality of his actions. At this point I think story I think he's very much a character who has been punished by the guilt he's carrying rather than some external arbiter. ...but Andreas almost steals the show when G'Kar does his impression of Emperor Cartagia. "Almost"? "Almost"? The rest of this episode could have been "Grey 17 is Missing Part II" and it would still be among my favorites just for this scene. It is a wonderful bookend to the original torture scene and another reminder of what a towering (and badly under-used) talent the world lost when it lost Andreas. A huge YES to this. I read his imdb information and apparently he was mainly a stage actor which might explain why there's no bigger movie roles. On the other hand: no it doesn't. How is it even possible that "no one" saw his work in B5 and absolutely kidnapped the man for a bunch of large movie roles?! In fact, he and Peter Jurasik (who played his on-screen rival, Londo Mollari) got along so famously, and had such incredible chemistry on camera, their scenes were often the easiest to shoot, rarely needing more than one or two takes to complete, and the two veteran actors' performances together were often hailed as some of the best of the series. The most important plot aspect is that of Londo's apology. I realize that some who have posted about the inaccuracy of his statement, never having said he was sorry before, are very aware of previous episodes in which he has said he was. But I don't think that's the issue here - this is not about truth, accuracy, or amnesia. It's about his consciousness of guilt, and what he is saying is that for the first time, he is so aware of his guilt that he feels the need to accept and acknowledge it. That, tied in with the heart problems and the immediate threat of death, is one of those central human issues that makes B5 deeper than the usual space action fare of some sci fi shows. This! Yes we've seen Londo throw around a few calculated apologies but there are "apologies" and then there are Apologies. Londo has always had a conscience - to his great annoyance, most likely! We've seen evidence of this along the four seasons. Also evidence of Londo being very good in rationalizing, and locking the voice of his conscience deep in a vault. Here, he has to face it all, every doubt he had, every mistake he made, and finally accept his responsibility. Even though I don't much care of this kind of dream scenes (and *really* don't like the kind of sudden mystic elements as e.g. the "Delenn with cards" part was), I think this was well made. About Lennier. I wonder how the writer(s?) rationalized this turn of events. I don't think it's good writing (and definitely not worthy of the writing of B5's general level) to make a character take this kind of near-180-degree turnabout. Obviously Lennier had loved Delenn for a long time. It's only human (minbarian?) to feel some degree of jealousy, and thus it's within the range of credibility that Lennier would decide to take the easy route by leaving. Considering that he's part of the religious caste and they should strive to conquer petty feelings, leaving is still a bit of strecth; however, understandable. However, he's talking about what can only be interpreted as too much of testosterone. I'm gonna join the Rangers and learn to fight and face awful danger and oooooh boy, then I'm worthy of you, like the masculine hero you've now married to? What?? Is this supposed to be the Lennier we've known for the past 4 years? Without even a slightest, tiniest, microscopic HINT that his personality might include the seeds for something like this? I'm sorry, I really am, but for me this is just bad writing. Was there some other-than-artistic reasons for doing this? Only one season to go, something dramatic had to be done with Lennier-character? I don't remember what's coming but reading your posts, I'm thinking something not good, so did they "have" to base his decision on something so outside his known character just to cause the future stuff to happen? Still, I'm not liking it.